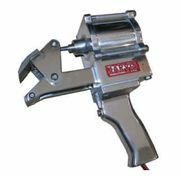 The Jarvis Model PFC-1 – pneumatic powered picking finger cutter. Lightweight tool only weighs 5.5 pounds (2.5 kg ) – easy on the operator. Fast and powerful; air powered to allow operators quick finger cutting with little effort. Stainless steel and aluminum construction – long wear and no oxidation. More power – larger piston. No operator fatigue – light trigger pull. Durable, sturdy design requires little maintenance.